When it comes to luxury and pampering, you probably won’t find anything that can beat what Heritance Kandalama has to offer. This hotel is located in an area which has been dubbed as the Cultural Triangle of Sri Lanka. With five UNESCO World Heritage Sites located nearby, the moniker is but understandable. 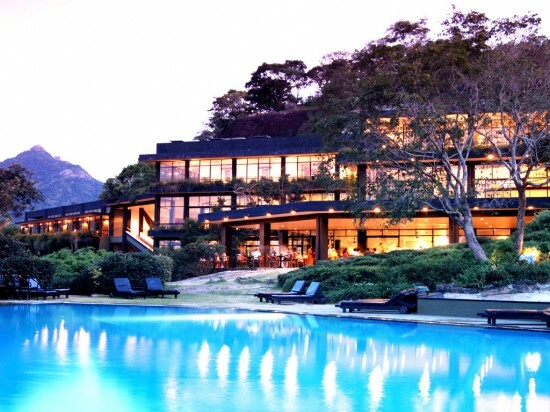 Heritance Kandalama, the hotel, itself is hailed by many as an architectural masterpiece attributed to Geoffrey Bawa. The idea behind the whole complex is for it to blend as seamlessly as possible with the amazing natural formations in the area. The hotel is situated in between two natural rock formations and is designed so that it resembles the wings of a bird spread out in flight. With its size – an astounding 1.8 kilometers from one end to another – one might think that it is impossible for the edifice to blend with nature. However, the opposite is true: one look and you will wonder at just how natural everything seems to be! Even more amazing is the design itself, which allows the natural waters from the mountains to flow underneath the building, which is raised using platforms and columns. One should not be surprised to find out that animals range freely underneath the building as well. The environment-conscious visitor will love the Heritance Kandalama for all its efforts to conserve energy. It has a very comprehensive program geared towards saving energy. The hotel makes use of auto-power controls, energy efficient lighting systems, and solar energy to heat the water supply. More so, the hotel does NOT make use of surface water to meet its needs. The water supply is a mixture of deep well water (using tubes going as deep as 200 feet) and rainwater. For the ultimate pampering experience, one will not go wrong with the Six Senses Spa, which has won numerous awards from all over the world. The philosophy of the spa focuses on the five senses – finding the perfect balance among them. Think of a pyramid with the base constituted of sight, sound, and touch; and taste and smell constituting the middle portion; for the apex, think of a symbolism of the entire sensory experience. The Six Senses Spa follows ancient Asian traditions geared towards rejuvenating the mind, body, and soul. They make use of indigenous herbs as well as tropical fruits and natural oils. Combined with steam, scrubs, massages, and other techniques, these herbs, fruits, and oils, are certain to please any visitor. While a visitor would probably be more than content to spend time at the spa and lounge around the premises relaxing, the hotel also offers other activities to engage the active guest. There are three swimming pools – each of which offers a unique attraction. The Infinity Pool blends with Kandalama Lake. The Nature Pool shares the same bedrock which the hotel is built upon. The Rashmi Pool is the largest pool in the hotel and is naturally warmed by the sun. Indeed, the Heritance Kandalama is the ideal place to go for a period of total relaxation.